"Even before the economic crisis of 2008, we set a profit margin of 10 percent as our goal at Mercedes-Benz Cars, as part of our “Go for 10” program. This still applies. 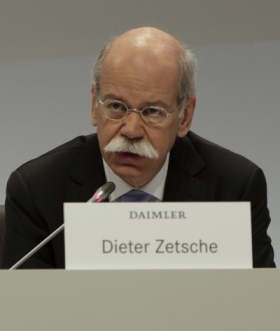 We reached this level for the first half of the year," Daimler CEO Dieter Zetsche said. A year before Dieter Zetsche took over as Daimler CEO, the company's Mercedes-Benz brand lost its place as the world's top-selling premium automaker to BMW. Zetsche wants the title back. The 35-year Daimler veteran talked about how he is going to help Mercedes return to No. 1 when he met with Automotive News Europe Editor-in-Chief Harald Hamprecht at Daimler's headquarters in Stuttgart. Dieter Zetsche, 58, has been Daimler AG CEO and head of the Mercedes-Benz Cars division since 2006. The German, who was born in Istanbul, Turkey, joined the company in 1976 as part of the research division. He has held key posts in just about every Daimler division including sales, engineering and commercial vehicles. Before being promoted to the company's top job, Zetsche was CEO of Chrysler Group, where he gained the nickname “Dr. Z” following a successful ad campaign. Less than a year after leaving the U.S. automaker's Auburn Hills, Michigan, headquarters, Zetsche was part of the team that sold Chrysler to private equity firm Cerberus, a move that quickly got Daimler back on track financially. He has a doctorate in engineering from the University of Paderborn, Germany. In a letter to your employees in July, you announced that you wanted to become No. 1 in the premium segment. What is your plan of attack? In recent years, we have already created the basic conditions for sustained success. We again have top quality and a clear, appealing design. We have expanded our traditional strengths, including safety. We are reducing our CO2 emissions more quickly than our direct competition and we are improving our customer relationships more vigorously than ever before. And this is all related to improvements in efficiency. That is naturally part of it. But due to the particular cycle, you don't end up at the same level each quarter and year. BMW grew 13.3 percent in the first half, Audi 11.8 percent and you 10.0 percent. In 2011 and 2012, many of our products are in the last third of their life cycles. The situation is just the reverse at BMW. That's why it is a snapshot. But I am convinced we can lead right through the cycle in profitability compared with our two competitors. When do you plan to be No. 1 and what figure are you targeting? Our goal is to be No. 1 in profitability and sales in the premium segment. The objective is clear, and so is our commitment. Concrete measures are next. We will talk more precisely about our milestones later. How are your profitability goals shaping up? Even before the economic crisis of 2008, we set a profit margin of 10 percent as our goal at Mercedes-Benz Cars, as part of our "Go for 10" program. This still applies. We reached this level for the first half of the year. And we don't have to hide from that. If greater potential in the industry should emerge, we will develop it. Is there a level you don't want to fall below? At Audi, it's 5 percent. Since you can't define the magnitude of crises, we don't do that. What about your return on capital? Some of your competitors, including Volkswagen, have set a target figure of 21 percent. Besides targets for our automotive fields, we have set strategic goals internally for capital turnover. Target figures for return on capital are inherently derived from the product of the two figures. Incidentally, our figures are higher than the one that you mentioned. What is your short-term sales goal? This year, we expect sales of more than 1.35 million for Mercedes Benz Cars. How many units do Smart and Maybach account for? Last year, the figure was 97,500 Smarts. In 2011, we are aiming for 100,000. For the entire year, that means you could still stay ahead of Audi, which wants to reach sales of more than 1.2 million. In recent years, we invariably sold fewer vehicles than Audi in the first four months of the year. This year, this was the case for six months. But we were still ahead for all of 2010. It is certainly a bit tighter this year. But I am confident. As early as last year, you announced that you wanted to sell about 1.5 million Mercedes-Benz vehicles in 2015. Audi wants to clear that bar in 2014. We'll comment on that at later. Are you undertaking new programs to cut costs and improve efficiency? In recent years, we have achieved substantial improvements at Mercedes-Benz Cars with our CORE program, and we are no less demanding for the future. We haven't launched any new programs in these areas, but we have set clear target curves for all the important control variables over several years, in hours-per-vehicle and in material and overhead costs, for example. Our goals are clearly anchored in the line. At the end of 2010, Daimler had 260,000 employees worldwide. The figure was 164,000 in Germany. This year, we will make more than 10,000 new hires globally, 4,000 of them in Germany. In the future, it's clear that we will predominantly see growth in the growth markets. In the compact segment, you want to expand the A- and B-class family to five models. Do you still want to double volumes there? We are striving for a considerable increase in volumes. That's why we have made investments in the Kecskemet (Hungary) plant, in addition to our compact-class factory in Rastatt (Germany). The Kecskemet facility will have a capacity of 100,000 vehicles a year. In the past, we sold 270,000 A- and B-class units at our peak. Time will tell where we will be with the full availability of all our models. You have 23 car body variations, compared with 21 at Audi and 19 at BMW. As a whole, we coincide in many areas. Today the biggest difference between us and Audi is that we have no representation in the A1 segment. Audi intends to hit 120,000 units a year in the segment. That also explains the volume difference compared with our portfolio. The situation is similar at BMW with its X1. It also accounts for a substantial share of the growth for this competitor. You will launch an X1 competitor. Will you also launch an A1 rival? If you only focus on sales figures, it is an interesting segment. If you look at profit margins, it is significantly less attractive. So far we have no plans for it. But we still have a few ideas for new models. We will use them to close gaps and forge ahead into completely new segments. We will employ these new building blocks in our attack. What is the total number of new products we can expect? By 2020, we will bring out at least 10 complementary models, like the new compact and the CLS Shooting Break. This may happen even faster. But expanding the portfolio is an expensive proposition. Initially, the prerequisite for a cost-effective expansion of our portfolio at comparably little expense and complexity is a disciplined architecture strategy, which permits the maximum modularization and flexibility in our two main architectures. Yes, with just a few exceptions. I am mainly talking about the new front-wheel-drive architecture and the rear-wheel-drive architecture for the C class and E class and its derivatives. The S class is not an integral component in this regard. We are naturally looking for the greatest possible use of common parts in sports cars and SUVs, something that we will increase even more in the future. This is accompanied by Daimler's substantial investments. Ten billion euros in 2011 and 2012, in research and development to renew and replenish our products as well as promote our two major visions: emission- and accident-free driving. And our plant investments are of about the same magnitude over a similar time frame. Will you have to boost your share of r&d? Daimler's share is now in the 5 percent to 5.5 percent range. The percentage is somewhat higher for Mercedes-Benz Cars at the moment. We are proud of the results: In 2010, we applied for nearly 2,000 patents. BMW, Audi and VW each had about 600 filings. That means we had more than BMW, Audi, and VW combined. That shows the innovative power of each company, which is ultimately reflected in products. When is the S class getting its long version and convertible? We'll let you know at the right time. How is the future of the Maybach shaping up? Will there be a partnership with Aston Martin? We have made no decision on Maybach. The analyses are on-going. Our thinking is moving in various directions and we are sticking with it. But you are considering launching a Smart eScooter. Will there soon be collaboration with Piaggio or the Chinese? There has been no decision on that. What is going on with the expansion of the Smart family? According to internal planning, a sales increase to 150,000 units by 2015 and 200,000 by 2020 is allegedly possible? We have never made statements about these specific volumes. It's true that we'll bring out the new Smart four-seater in 2014. We haven't decided whether there will be more models. We are focusing on the two- and four-seat models in cooperation with Renault. We recently heard that Renault has withdrawn from the alliance's two-seater? It's true that we are planning a common architecture. A possible two-seater from Renault was never relevant to the economic feasibility of the overall project. Our third generation is and will be profitable. And you are planning a model based on the Renault Kangoo – internally known as VS10 – starting in 2012? Yes, that is a very interesting project. A small city delivery vehicle, primarily for commercial use, is being developed on this basis. It is being optimized for longevity, quality and appearance and is closing a gap in our light commercial vehicle product line. The internal abbreviation for it is VS10. If you say so … In any case, dealers already have high expectations for it. We're also planning a purely Mercedes successor in the Vito-Viano segment. Is the successor to the Vito-Viano, code-named VS20, a similar project? No, here we are planning a purely Mercedes successor, which could also have front-wheel drive, possibly using a Renault powertrain. How is the cooperation with Renault-Nissan on engines doing? Nissan mainly is interested in gasoline and diesel engines for Infiniti models. And do you also plan to make your MFA platform available to Infiniti? There has been no decision on this. There is recognition that there is practically no substitution between Infiniti and Mercedes. The research has shown that the Lexus is rather seen as an alternative to Mercedes in some markets such as the U.S., whereas Infiniti tends to be a competitor to BMW. Who do you see as a competitor in the premium segment globally? Twenty years ago, we had Cadillac, Lincoln, Jaguar, and Volvo as competitors, at least in markets like the U.S. This has lately been reduced to Lexus, BMW and Audi – a great success story for all of the German brands. What are your plans for U.S. market? We are convinced that we have all the preconditions in the U.S. to become the volume leader in the premium segment in the future. During the economic crisis, we built up our sales channel tremendously. The so-called "Autohaus" project, in which dealers invested $1 billion, was unprecedented. Of course, this is not just a matter of marble, stone and glass. Instead, it is an alignment and a qualitative positioning that is excellent. We have seen an excellent position develop compared with our two competitors in the U.S., as part of the relative perception of our market position worldwide. Audi wants to double its U.S. sales to 200,000 units by 2018 at the latest. At what point do you plan to be No. 1 in the U.S. premium segment? Absolute growth depends very heavily on on-going, general economic trends. We don't think it's reasonable to cite a specific date due to the great uncertainties. You plan to start building the C class in your U.S. plant in 2014. Which models? It's well-known that we are investing $2 billion on the factory expansion. For the C class, we are initially limiting ourselves to the C sedan. America is no market for station wagons. There has been no decision on other models, like the coupe. But according to reports you want to have another M-class model, known as the MLC, built there starting in 2015 and position it against the BMW X6. I am familiar with this speculation from the media. What are your plans for China, where you started local production late and still need to catch up? Over the last few years, we have been catching up very quickly in China, after entering the market relatively late with our own production. Starting this year, we are building the GLK and then gradually the three model lines of the new generation of the Mercedes-Benz compact car locally. The existing assembly capacity for the C class and the E-class long-wheelbase version will be expanded further from the current 80,000 vehicles based on market demand. In 2015, we expect sales of more than 300,000 units in China, of which two-thirds, or 200,000, will be produced locally. Do you need a second factory in China? We are continually in growth mode. But we can't talk about the next steps today. One thing is clear: In China, there are more than 120 billionaires and about 670,000 millionaires. Until they are all driving the S class, we still have things to do. A look at your sales structure reveals that you do 50 percent of your business in western Europe. Will that change in the future? We will continue to grow very disproportionately in growth markets outside of Europe. Not just in the U.S. and in China. No matter whether it's India, Korea or Turkey, we will exploit the potential wherever there is growth. With your new facility in Hungary, you now have 12 main production locations for cars worldwide. How many more will you need to support the growth you are targeting by 2020? It's too early for concrete statements, but be assured – the planning is on-going. This autumn, BMW will make a decision on a CKD factory for cars in Brazil. How do you assess this market? We are well positioned with our CKD plants worldwide. In Brazil, for example, we have had a factory in Juiz de Fora since 1999, which we transferred to the commercial vehicles area in 2010 since the premium segment in Brazil remains quite small. The major growth in Brazil is in the $5,000 to $15,000 segment. In the face of this global trend in the low-cost and volume segments, doesn't it make sense to incorporate a high-volume brand once again, even if deals with Chrysler and Mitsubishi failed? No, we are a premium manufacturer. On specific issues, where volume plays a major role, cooperative projects like the one with Renault are a good solution. Moreover, we do not plan to become involved in the high-volume segment ourselves. Instead, you entered into a cooperative venture with Tesla. How is that relationship developing? In May, we participated in a capital increase so as not to dilute our stake. It has been a very gratifying collaboration for both sides. We are continually looking for new content. Rumors keep circulating that you would be willing to cooperate with Toyota on fuel cells. We will already be set for the regular production of our own model in 2014. There is no cooperation on the horizon. But we are ready to pull out all the stops with partners on infrastructure and overall acceptance. Toyota can become more heavily involved in Japan, as we can in Europe, and Ford, our partner in the development of fuel cell stacks, in the U.S.
How quickly can the costs be driven down? Hydrogen is a promising alternative to the lithium ion battery as energy storage for electric vehicles. Hydrogen, produced with renewable energy, is increasingly seen as the optimal storage medium. The Mercedes-Benz F-Cell World Drive proved that we're the leaders in this technology and that it is ready for customers and everyday use. Now it is a matter of driving down the costs. We see ourselves in position of roughly reaching the cost position of the diesel hybrid by 2015. Parallel to this, we have teamed up with Linde to shoulder an investment in 20 hydrogen fuel stations in Germany. Are you satisfied with your Formula One team? Things are not going satisfactorily for the second season with the new team. The hoped-for improvements have not been realized. But you can't force it. We're confident we will race to victories again. Formula One has a huge presence, especially in all the important growth markets. It's clear that a presence alone doesn't go far enough but has to be demonstrated positively, with cars capable of winning. But we have staying power. Your contract runs until 2013, at which point you'll be 60. Do you plan to retire or remain CEO? That is a question that you have to address a year before the expiration of the contract, not earlier.